Rich soil with plenty of added compost. Weekly liquid feed from mid summer onwards. Basil, Garlic, Nasturtium, Asparagus, Carrot, Celery, Cucumber, Onion, Parsnip, Pepper, Borage, Chives, Monarda, Onions and Calendula. Sow in pots under cover in mid spring and plant out in early summer. Tie upright types to canes with string to support the weight of the fruit. Remove side shoots which grow in the angle between the leaf stems and the main stem of the plant. Pick regularly as soon as the fruits are ripe. This encourages production of more tomatoes. 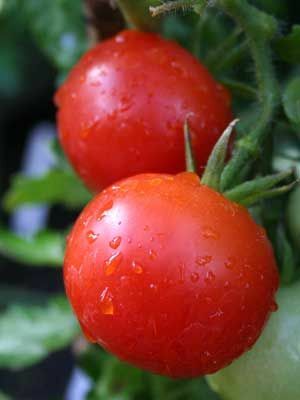 Blossom end rot patches on the bottom of fruits are a nutritional disorder best prevented by growing tomatoes in well-prepared soil with constant light moisture. Yellow leaves indicate lack of magnesium, so apply liquid feed.